Mono can be a pretty yucky illness to have. All of those symptoms, like fatigue, sore throat, and fever can really take their toll on you. It's important to seek treatment if you do have mono. The illness will eventually run its course, but treatment can leave you feeling a whole lot better, a whole lot faster. It will also help to prevent any further complications associated with the mono virus. Though there is no cure for mononucleosis, there are some simple things that you can do at home to help you fight off the illness. Staying well rested, avoiding physical exertion, and adhering to a special diet can really help reduce the intensity of symptoms. 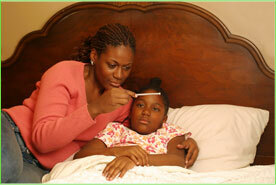 There are also a variety of medicines available to help cure complications associated with mono. If you are suffering from mono you may also be interested in trying out a variety of vitamins and herbal supplements to help boost your immune system. Things like Vitamin C, shiitake mushroom, and zinc can really make the going a little easier when you have mono. These naturally-sourced supplements work to reduce the pain of symptoms as well as help restore your body's energy. There are also a number of things you can do to help minimize your risk of catching mono in the first place.